Have you run out of unique eyeshadow ideas? Take a walk on the wild side with yellow eyeshadow looks you've never worn yet! There are a few colors of eyeshadow that typically aren’t worn simply because they usually don’t look good next to people’s eyes. Canary yellow, bright orange, and red are a few of those colors that most stay clear of. So to test the waters a little bit, I decided to create a couple of looks that incorporated bright, lovely yellow. I wanted to discover looks that were pretty and fashionable, not ones that looked like they were pulled off of a blank-stare boyish runway model. Yellow eyeshadow is most easily worn by brown eyes, and probably least easily worn by green eyes. Blue and hazel eyes likely fall somewhere in the middle of the spectrum. With a little trial-and-error, however, you can create beautiful looks using just about any of the colors on the color wheel. 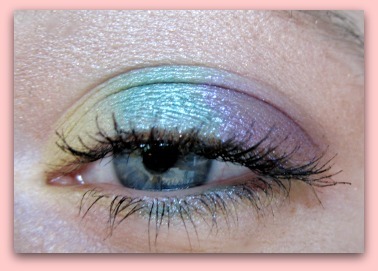 I chose a daffodil yellow eyeshadow and shimmery blue and purple eyeshadows to create this look. The purple eyeshadow is NYX Purple loose shimmer powder. The blue eyeshadow is NYX Turquoise loose shimmer powder. I love these tiny jars of shimmery makeup. They are inexpensive, full of pigment, and come in tons of beautiful colors. I started by applying the yellow color to the inner corner of my eye and working towards the center eyelid, sweeping just a tad to my lower lash line as well. I then picked up some turquoise blue and dabbed it directly onto the center of my eyelid and the center of my lower lashes, blending outwards. After cleaning off the brush, I began sweeping the purple eyeshadow onto the outer edge of my eye in an almost V shape to deepen the look and add definition to my eye. Feel free to add pigment to any of the rainbow pieces, or go back and blend them together even more until they flow. This second look is a bit simpler, but looks even more sophisticated. It uses a pale gold shimmery eyeshadow, yellow eyeshadow, shimmery purple eyeshadow, and a purple eye pencil. To create this look, use your yellow eyeshadow to simulate thick eyeliner and a wing on your eyelid. You might need to trace the line with a white eye pencil and then fill in with your eyeshadow. Then highlight beneath your eyebrow using the pale gold shimmer powder. Once your upper eye is complete, line your lower lashes from corner to corner with the purple eye pencil. You will want to create a wing that meets and follows below the yellow wing. Deepen the shade of your line if necessary. Then, pick up some shimmery purple eyeshadow and dab it beneath the purple eyeliner, blending slightly outwards and downwards. 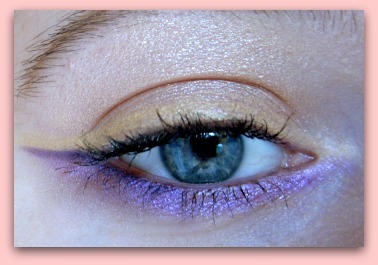 This should give you a beautiful purple base that brings light to your eyes and contrasts with the yellow liner. Purple and yellow are known for being complementary colors, but don’t be afraid to experiment with other colors you think might look even better against your eyes or hair. Return to Makeup Tips Home from "Yellow Eyeshadow"